Guess everything has been around somewhere before! Units can’t conquer a field that is next to a unit of the same level in wodan. 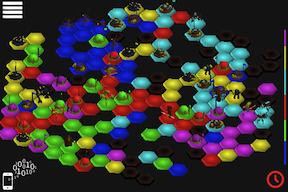 In tactica units only defend their own square, not all adjacent ones. there are trees on tiles that are basically blocking the income of a tile and can be cleared by any unit. If left alone those trees grow into forests, cutting hard into your income. Basically like a neutral player. Sounds interesting. Now I’m thinking about adding option 1 to tactica, it could increase tactical deepness. Fact 2 also seems to encourage tactical thinking, but a tree growing into a base seems weird to me. Let alone in my sci-fi setting, what should grow into a bunker?!? I don’t know about 3 and 4, think those wouldn’t really improve the game. Especially 4 would make everything more complicated.